I'm picking up Eli 14.6 from school. "Oh man, I got shut down so hard at the Flower Festival," I say as he gets into the car. "I asked every girl in the town to dance with me and got rejected. Maru said 'Ew. No thank you.' "
"Oh, that's terrible," he says, laughing harder. This is the current in-house craze: Stardew Valley. It's generally described as a Harvest Moon-type game, which is true, but it really doesn't do it justice. I've played Harvest Moon games, and I've never enjoyed them like I enjoy Stardew Valley. What's hard to explain is why. To some degree, it's the details. Let's use fishing as an example. 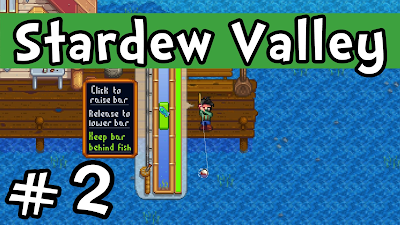 I'm a terrible farmer/gardener in these games, but I love to fish. So I've basically ignored my farm and focused on fishing instead. This screenshot thanks to a Let's Play by paulsoaresjr: Stardew Valley E02 "The Art of Fishing!" (Gameplay Playthrough 1080p). When you hook a fish, you see that bar, and the fish moves up and down. You, in response, need to move that light green rectangle up and down, keeping the fish inside the rectangle. If you do, you reel the fish in. If you don't, the fish takes out line, and you can lose them. At the beginning, it's surprisingly hard. Frustrating, even. A bit of practice, though, and a few skill/rod upgrades, and you become much better. Different fish have different styles of fighting, just like in real life, so even before you see the fish, you can generally tell what you've hooked. This is very true of real fishing, and it's an outstanding touch. Also, and this is another great touch: if you see a patch of water with bubbles, that indicates a school of fish, and if you cast into that area, the fish will hit very quickly. Again, that's a very nice approximation of what happens in real life--active water indicates bait fish being disturbed or trying to escape. In the village, there are ponds, lakes, rivers, and an ocean area, all with their own fish types. Plus there are fish only appearing at night or in certain seasons. It's all very thoughtfully done, and it's enormously satisfying to play. Now, the best part: the whole game is like this. Everything I've done has been fun and clever. It's totally relaxing, and the graphics and music are perfect for this kind of game. Here's the Steam link: Stardew Valley.